Just as Long Island has begun to recover from Hurricane Sandy, another storm has begun it's approach, and threatens to cause untold damages only days after Sandy ravaged the area. Just as Long Island has begun to make its slow recovery from Hurricane Sandy – the epic storm that knocked out power for millions and displaced thousands, the weatherman has some more bad news for the badly beaten Northeast Region, predicting that a Nor’easter is headed for New York, and will hit Long Island this upcoming Wednesday or Thursday. The impact of this second storm could be astronomical – putting lives in danger, and undoing some of the progress that has been made cleaning up and repairing Long Island post-Sandy. According to Accuweather’s Meteorologist Brian Edwards, this storm is going to have strong winds, heavy rain, a possibility of snow, and sea levels could be up to 5 feet above tide level when it hits, which could cause coastal flooding. Because of the massive amount of damage caused by Hurricane Sandy to the barrier dunes on many Long Island and Fire Island Beaches, this rise in sea level could be absolutely devastating for some areas, and cause untold flooding and damages to areas that have already been badly beaten. A Nor’easter of this magnitude will exacerbate another big issue on the minds of many Long Islanders – it will drop the temperatures down even lower, a major concern to the hundreds of thousands of Long Island households that are still without power. The additional drop in temperature turned the current power situation from inconvenience to danger for many who are without a generator, and unable to heat their homes. Although there are numerous warming stations in both Nassau & Suffolk Counties, many locals are unable to reach these locations due to the gas shortage, and there are many sick and elderly who are simply unable to travel. With the high winds that are predicted, temperatures could drop as low as the 20s or 30s with a possibility of snow, putting many in danger of hypothermia if they are unable to heat their homes. This new impending storm could add insult to injury for many, as relief and repair efforts for Sandy could be paralyzed or completely undone, depending on the ferocity of the storm. One of the biggest worries on the minds of Officials is the massive amount of debris and tree branches that are still littering roadways and yards, and if left unsecured, these could cause additional damage to homes, businesses, and utility lines that have just been repaired, or are still in the process of being repaired post-Sandy. Before the Nor’easter reaches Long Island, it is important to clean up and secure as much of this debris as possible, in order to reduce the chance of additional damage being caused. With gusts of wind potentially reaching speeds of 60MPH, loose branches and debris has the potential of re-creating the destruction caused by Sandy, something that many Long Islanders fear. LongIsland.com will be sure to bring you updates as quickly as possible as more information about Sandy’s “sister-storm” becomes available. With a few days between us and the Nor’easter, it is recommended that you obtain additional supplies and gas if possible, and clear your yard of branches and debris. We have been providing constant coverage on all of the important topics for Long Islanders as we recover from the Frankenstorm – for the latest status updates School Closures, Gas Availability, Relief Efforts and more, please visit our Articles Section. Have a tip or want to share your Hurricane Sandy story or pictures? Email us at news@longisland.com to share with us. 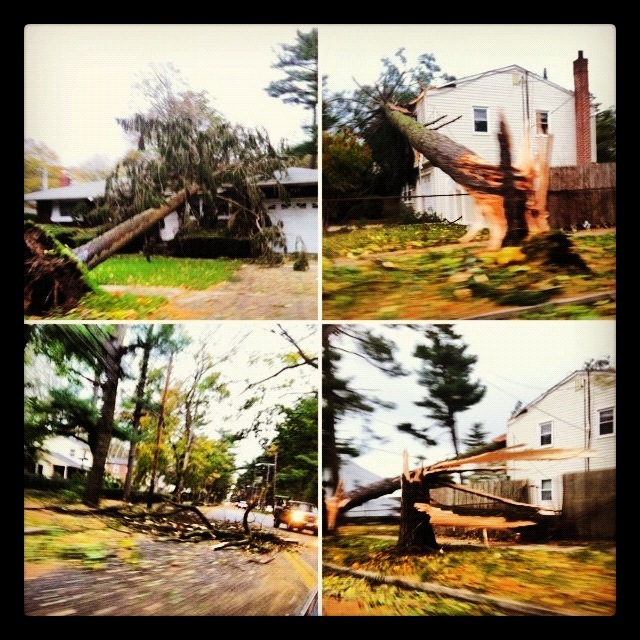 The included photo is of a downed tree on Washington Avenue in Brentwood, days after Hurricane Sandy hit. Photo Courtesy of Evelyn Ortiz. Subject: LongIsland.com - Your Name sent you Article details of "Massive Nor'easter Approaching, Threatening to Undo LI's Post-Sandy Progress"